Today’s post is by Susan Robbins Etherton. For the past nine years, Shalem Society members have gathered together at Bon Secours Retreat Center in Marriottsville, MD, for an annual retreat. This past October was my third gathering and these are some of my reflections from that retreat. When I arrived at Bon Secours and found my room, I was delighted to see it had a view of the pond. 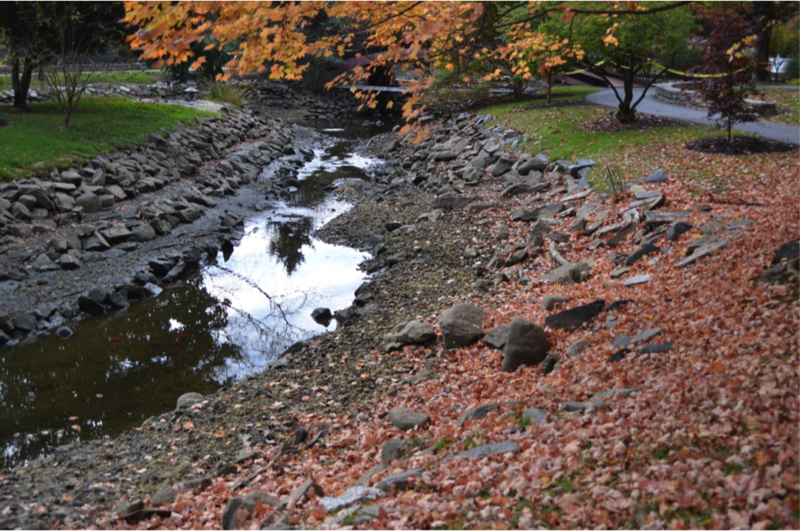 Through brightly colored leaves, I caught a glimpse of water shimmering below. Ah, the pond! Still water, reflecting clouds and sun, holding leaves aloft – oranges and yellows, sky blue, greyish white and dark green. I noticed the low, constant hum of machinery. I had come to expect the quiet, undercurrent of workers who care for this place. I was grateful for them; grateful for their attention and provision that allowed me and others to retreat without worry or care. Maintaining a beautiful, peaceful place like Bon Secours is always a work in progress. As I made my way downstairs, I was excited to head outside – to greet the pond that always refreshes me. Yes, the pond was there – and yet, it was somehow different. On one side of the pond, I observed two large round tubs, bright blue plastic, like small swimming pools, full of water and leaves. 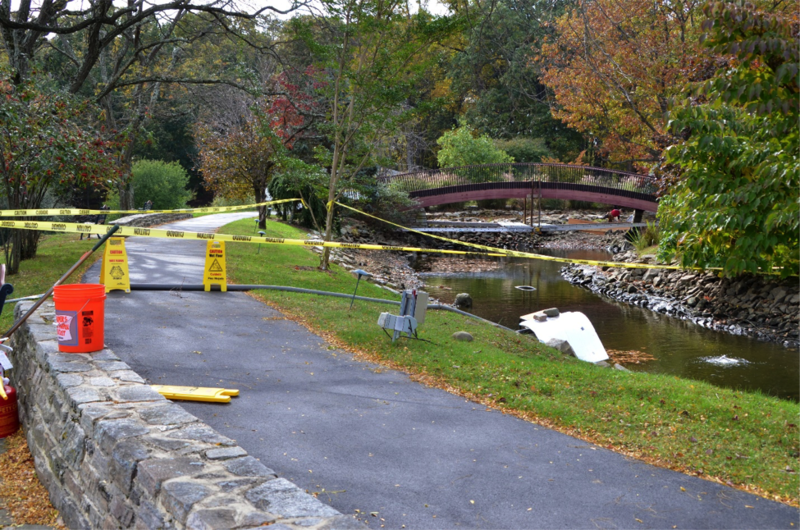 On the other side of the pond, yellow caution tape festooned the walkway and a large black hose emerged from the pond, snaking over the walk and emptying out onto the grass. I looked across the pond to the footbridge – a beloved place to walk and reflect. Something like a ladder was suspended below the bridge across its entire length. More of the yellow caution tape was draped over either end of the bridge, barring entry. I walked around to the far end of the pond. The cattails and other grasses had been leveled. The droning hum, now loud and its source clear, came from the engine of a pump. The scene began to make sense. They were draining the pond. Confident the work would soon be over, I returned inside. The gathering room was full of loving faces and expectant energy. Greeting friends, I knew great joy and peace at this homecoming. Several days of quiet, in deeply contemplative community, awaited me and I was eager to settle into the now-familiar practice. As we moved into the second day of retreat and began the Great Silence, I headed outdoors to the pond determined to enjoy this sacred place. I found a bench facing the woods with my back to the pond and equipment. I tried to imagine the continuous, loud drone of the pump as a kind of white-noise. Only later when the pump ran out of fuel and stopped did I realize how much I missed the pure quiet of silence. Draining the pond. Moving into a time of reflection, the image teased my spirit. In draining the pond, the clouded water was being poured out. Fallen leaves that had clogged the pump were being cleared away. The underground systems could be viewed and checked for leaks or needed repairs. The bridge was being shored up so it could once again bear the weight of travelers. Silent retreat is a form of draining the pond for me. I experience a clearing out of my heart space. All that has clouded, cluttered and clogged my spirit can be swept away leaving a spaciousness to consider my own underground systems. Where are the leaks that need tending? What are the broken places or areas needing reinforcement? I undergo a deep and cleansing emptying, exposing myself, broken and bare, safe and open to the tender care of Spirit and loving community. The next day, the water in the pond was very low. Now attuned to the changes and process, I noticed there were fish in the pond. 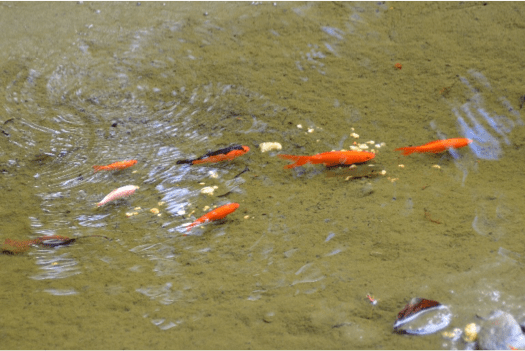 The large, easily seen ones had been moved but, with the pond almost empty, I could see baby fish – small orange treasures huddling together looking for safe waters. I appreciated that the workmen spent a great deal of time to safely gather these baby fish and move them to a holding pond while the base pond was repaired. I wondered what infant gifts were waiting to be noticed or discovered in me? As I continued each day to watch the water recede, I began to see the rocks and sediment – the bedrock of the pond. Yes, there were places that needed repair, some shoring up of weak spots, but I could also see the strength of a solid and well-built foundation. Refilled with fresh water, the pond would once again be refreshing, peaceful, a place of great beauty, reflecting all of creation around it, offering itself as a place of rest. I imagine myself cleared, unclogged and repaired. I cherish the infant possibilities I will discover. I see myself filled again with new life, Living Water. Refreshed in body and Spirit, knowing the peace that surpasses understanding, I am once again a source of love and refreshment for the world. I resurface grateful — full and free to reflect God’s unending beauty. Susan Robbins Etherton is a graduate of Nurturing the Call: Shalem’s Spiritual Guidance Program. A member of Spiritual Directors International, Susan has actively engaged in the ministry of spiritual direction since 2007. She is married and the mother of two children. Susan says, “I love God, my family, singing and nature. For fun I play around with a camera.” She is a member of the board of Shalem Institute, and be sure to look for her photographic contributions to Shalem’s daily Facebook postings. Susan Etherton is a Spiritual Director in Northern Virginia and serves on the Board of the Shalem Institute for Spiritual Formation. Susan is an ordained Elder in the Presbyterian Church (USA) and worships at Arlington Presbyterian with her husband, Jon and their two college-aged children, Sarah and Jay. As a beloved child of God, she rejoices in the gifts of creation through her spiritual practices of photography and song.